I’ve read a number of accounts where atheists are accused of being narcissistic, because we supposedly set ourselves up higher than God… more important… smarter… too independent. We think we’re better than God, so the claim goes. I’ve always found that very odd since, by its very nature, atheism generally indicates the opposite view. We’re not special. We’re animals, very much like all the other animals on this planet. We’re not the "pinnacle of creation" but are merely evolutionary products who continue to evolve as time slowly marches inexorably past. We are born. We live. We die. There’s no grand plan. There’s no heavenly purpose. In the grand scheme of universal timelines, we’re so monumentally insignificant that it’s hard to see how we could feel very self-important… though the accusation still remains. Perhaps it’s because theists think of us as rejecting God or rebelling against Him… as actually believing in God, but simply finding ourselves "disinclined to acquiesce to his request," somehow thinking ourselves superior or far too dignified to pay homage to His greatness. If that’s the case, it’s quite odd. It’s not that atheists reject God. It’s that we don’t believe he exists. Rebellion is not something that can be staged against a nonexistent entity. Superiority is not something you claim against… nothing. Maybe it has to do with a truth claim. Perhaps theists feel that we’re smug and self-satisfied in our self-proclaimed ultimate knowledge of God’s non-existence… what with all our "science" and "facts" and "evidence" and that sort of thing. But that, too, seems odd, since atheists with a sense of rationality don’t make such an absolute claim to the truth. Certainly scientists don’t! We leave the claims of absolute truth to the theists… to the Christians, the Muslims, the Jews, the Mormons, the Catholics, the… you get the picture. We know that the non-existence of God can’t be proven, but we also know that there’s no evidence at all on the theist’s side of the fence. We also know that there is quite a bit of evidence that points toward God’s non-existence, but that there is no (nor can there be) unequivocal proof of that negative hypothesis. What we can do is base our thinking on naturally observable, testable data and go from there. Supernatural beliefs (and yes, that includes a belief in a god) don’t advance our understanding of the universe. They don’t help our survival. The don’t benefit the human race. They show us nothing about how our world works. On the other hand, theists (fundamentalist ones, in particular) tend to believe that humans are God’s special creation, unique and cosmically important… much more important than mere animals. So important, in fact, that the universal laws were created just for man’s existence, all of them so finely tuned that just a tweak of the stellar dial in either direction and we’d be snuffed out. So important that God made a planet just for us… a virtual Garden of Eden (though we evidently borked that up long ago) created to house His epitome of perfect creation. He listens to each of our prayers and loves every one of us as individuals. He helps guide our lives, helps us through tough times, bestows his grace and attention to us, and chastises our misdeeds with a loving, caring hand. Now I’m sure not all theists think that way, just as all atheists don’t think the same way I do. There are arrogant atheists just as there are arrogant theists. 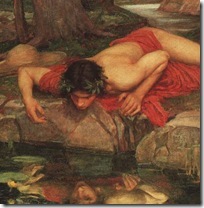 Humans are, by nature, narcissistic to some degree. It’s in our DNA. However, theist and atheistic beliefs are fundamentally different. Theists tend to believe they are God’s special creation. Atheists tend to believe they are cosmically insignificant. It’s easy to see where the label of "narcissist" should be applied. God needs your love, too. I like the sentiment of the first part, though I think time plays a part, too. However, the second part gave me pause and actually got me thinking about something that’s puzzled me about theistic religions. If their God is perfect, why would he need your love? Actually, why would he need to have created mankind at all? Taking it further, why would he even have bothered to create the universe? No matter what reasons are given, they all attribute human needs and characteristics to God. Needy? Bored? Curious? Jealous? I would think a perfect god would never have needs… or wants. If he’s perfect, then that’s that. Has anyone heard any really rational reasons for God’s demands of obedience? …or for his creating everything in the first place? I’ve yet to hear one, even from my religious friends. Most people, I believe, think that you need a God to explain the existence of the world, and especially the existence of life. They are wrong, but our education system is such that many people don’t know it.